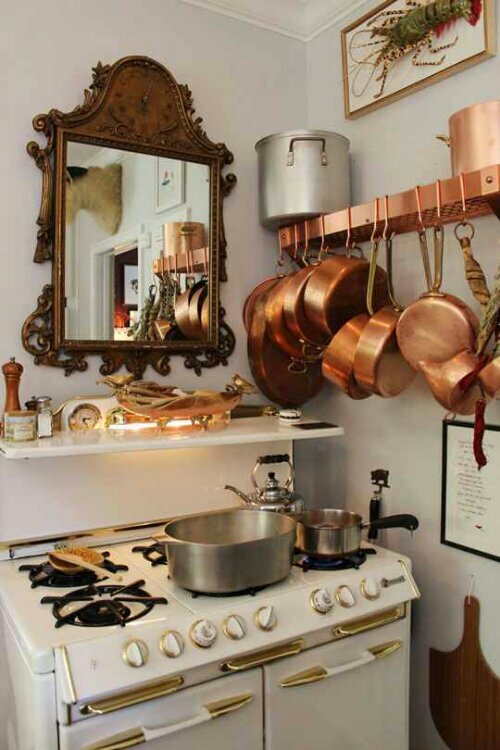 What I like about this small kitchen space…. First, sorry I haven’t been posting. Some things have come up in conjunction with me being under the weather. Anyhoo, the shelf above the stove is a perfect place to stock spices. You all know my love of space storing tips like pot racks & pegboards. Filling in any nook and crany to create a functional area is a great way to utilize the space. Plus jazzing it up with an ornate mirror in the kitchen is a little unexpected. Here is another look into small kitchen storage ideas. Next Post Entryway wall of mirrors.